Are you looking for a standard portable cooker for dormitory use? Or do you need an additional burner for your kitchen under economic range? If yes, then you can try Sunpentown induction cooktop. This energy-efficient induction plate can cook the usual family-meals in a faster way. Here goes a brief review about Sunpentown Induction countertop Cooktop. Hope it helps! Sunpentown induction cooker is suitable for both indoor and outdoor use for its portable and sleek structure. Its dimensions measure about 11.81″ x 14.17″ x 2.48″ weighing about 5 lbs. This countertop cooktop is quite trouble-free to install. You can easily place it on the kitchen countertop, RVs, or any other place where a 120-volt power outlet is available nearby. When the cooking-task is done, you can easily store this induction oven, if there is space-limitation. Sunpentown portable induction countertop cooktop offers about 13-level temperature settings. The temperature setting ranges from 100ᵒF to 390ᵒF. It gives you the freedom of cooking with different temperature requirements like boiling, searing, steaming, etc. 100°F, 120°F, 140°F, 160°F, 180°F, 190°F, 210°F, 230°F, 250°F, 280°F, 300°F, 350°F and 390°F. Sunpentown portable induction cooktop offers about 7-level power settings. It allows you to cook a variety of dishes at a different speed. You can boil water within a few minutes or set program for simmering. You can also choose slow cooking. 100-watt, 300-watt, 500-watt, 700-watt, 900-watt and 1300-watt. Sunpentown single burner induction cooker appliance not only helps in cooking but also contributes to meal serving. The range of heat settings serves two functions in a broader aspect. Those are cooking and warming. You can easily select the temp and power settings to prepare your meals at a desired temperature and speed, you prefer. Later, you can choose a lower-level heat settings to keep the food warm before placing on the dining table. Cooking time is a big issue for students, working moms as well as busy people. And a significant feature of Sunpentown induction stove is it cooks faster than any standard gas cooktop, electric hot plate, traditional burner, etc. The induction technology transmits heat instantly to the pots/pans and cooks the food efficiently at a faster speed with perfect browning and taste. The smart control panel is very user-friendly. The LED display shows the current temperature, power and time. All the buttons are placed in a systematic way. They are easy to find and use. Moreover, there is no risk of button malfunction, as Sunpentown has no push-button. You will really enjoy the high-end touch controlling system. The Sunpentown countertop can transcend much expensive induction ranges with it’s Timer option. Generally, the induction cookers 2 to 3-hour ‘Timer’ option. But the most interesting fact about Sunpentown induction countertop burner is it includes a ‘Timer’ option that can serve as long as 8 hours. Adding to this, you can choose different heat settings from the first minute to the last minute in this 8-hour duration. Sunpentown 1300W Induction Countertop Cooktop includes an auto-pan detection sensor. If the user places an induction incompatible cookware over the cooking surface, then the unit will display an error code through the LED display. And later the system will take an auto shut down within a minute. One of the most admirable features of Sunpentown 1300 -watt induction countertop cooktop is it’s “lock” feature. If you are placing this portable induction burner inside a home with children, then the “lock” feature will ensure your kids’ safety from burning, even if they touch the cooking surface while the burner is functioning. However, this child-proofing mechanism can also avert the incidences like, accidental change in previously set temperature/power level. When the user chooses the heat-settings and presses the “lock” key, the burner will follow the program, unless the user unlocks it for making further changes. The LED display shows the current heat settings and the remaining-time alternatively, even if the cooktop is set at the lock position. It is one of the best features of the Sunpentown portable burner, which makes it different from the other alternatives under similar price-range. Sunpentown induction cooker’s surface-area bears high-standard micro-crystal built ceramic plate. This makes the cooking surface smooth and easy to clean. 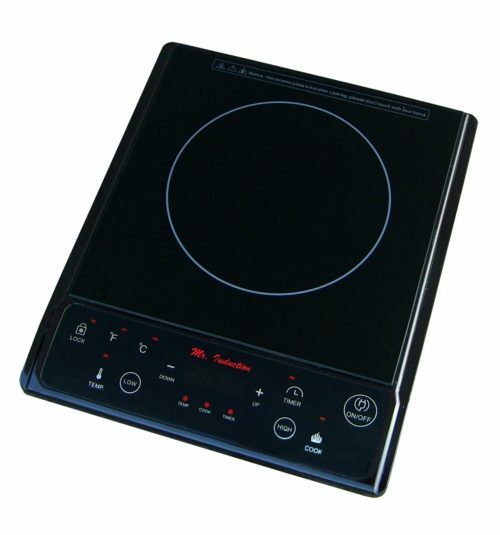 Moreover, the shiny black ceramic glass top makes this single burner induction cooktop look trendy. It can be a good choice for dormitory use. Sunpentown countertop cooktop does not work with the open flame. There is no risk of fire hazard. So, it is comparatively safer than an electric hot plate, gas burner or other conventional burners. The induction mechanism generates heat and transmits this heat directly to the cookware-base. During cooking Sunpentown burner’s surface remains cool. So, if someone touches the burner, it will not cause finger-burn. When the induction pan is removed from the cooking surface, the heat generation stops without any delay. It saves both the burner and the user. Read: How to Buy an Induction Cooktop? Dimensions: 11.81″ x 14.17″ x 2.48″. Dual functions: Cook & Warm. Temp Setting Range: 100ᵒF-390ᵒ F at 13-level. Power Setting Range:100-1300W at 7-level. Touch-sensitive control panel LED display system. Ceramic Top with Micro-crystal Furnish. The Sunpentown induction cooktop can reach up to a maximum of 1300 watts. The user might require higher power settings to cook some special dishes. However, it’s heat-setting range is enough to cook for regular family food and dormitory meals. Another limitation is that like any other induction range, the Sunpentown induction burner works only with the induction safe pans. Sunpentown 1300-watt induction countertop cooktop review shows that this standard induction burner can make the cooking task easier for students, bachelors, and elderly persons. Moreover, in case of residential use, this portable Sunpentown 1300-watt induction cooktop keeps your home and children safe from any unwanted burning incident. It is certainly one of the top-rated induction burners under affordable price-range. Where to Buy Sunpentown 1300W Portable Induction Countertop? Read Ivation Portable Induction Burner Review. 5 Where to Buy Sunpentown 1300W Portable Induction Countertop?